Elizabeth Arneson of About.com has estimated that there are over 10,000 bed and breakfasts (B & Bs) in the United States, based upon information from the Professional Association of Innkeepers International and a nationwide listing of bed and breakfasts available from Abacus Computing. The popular website, www.bedandbreakfast.com, has listings of over 4,000 bed and breakfasts in the United States and Canada. The top ten states, by number of bed and breakfasts, are California (804), Massachusetts (723), New York (508), Pennsylvania (425), Michigan (368), Maine (334), Washington (323), Texas (267), Alaska (258) and Virginia (250). To encourage the use of locally grown food in B and Bs, the Cornell Cooperative Extension program of Madison County has initiated a creative program to promote the cooperation of farmers and B & Bs in New York. The cooperative extension program has enlisted the Empire State Bed and Breakfast Association, the Northeast Organic Farming Association of New York and the NYS Small Scale Food Processors to sponsor two upcoming meetings where connections can grow between operators of B & Bs and local farmers. Registration is available by calling 315.684.3001 for (1) a meeting on April 3 at The Farmers’ Museum, 5775 State Route 80 in Cooperstown (Otsego County) and (2) a meeting on April 9 at the Cornell Cooperative Extension of Warren County in Warrensburg. 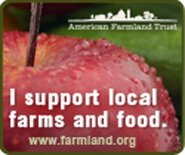 The enormous expansion of restaurants nationwide sourcing their menus from local farms is an encouraging sign in an era of globalization when many feel dismay over industrial agriculture which treats food as a commodity like oil and gas. Chefs with a commitment to using local foods have helped to rebuild local food economies by providing a market for the bounty grown on local farms, thereby preserving small family farms. This program to expand the number of B & Bs utilizing local foods, by promoting relationships between innkeepers and local farmers, builds on this success and deserves kudos. It can be a model for other states and Canadian provinces. Michael Pollan in The Omnivore’s Dilemma (The Penguin Press, New York, New York, 2006), one of the most significant books of the new century, has pointed out that industrial “egg operations are the worst” from everything he has “read” since he “hasn’t been able to get into one.” These operations treat egg laying hens as “machines or ‘production units’ incapable of feeling pain.” The hens live “in cages too small to even stretch a wing” and end their short lives “when output begins to ebb” by being “force molted” described as “starved of food and water and light for several days in order to stimulate a final bout of egg laying before life’s work is done [p. 318].” How much better to enjoy a helping of sunny side up eggs or an omelet at a B and B which commits to using local food rather than scrambled eggs poured from a carton at some fast food joint or at a chain hotel’s buffet. 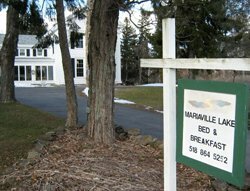 For example, in the sprawling Capital Region of upstate New York, the Mariaville Lake B & B offers lakeside accommodations where breakfast “is an unrushed event” prepared with “local or organic ingredients” by innkeepers “always happy to accommodate a vegetarian or vegan lifestyle.” This is hospitality which enriches a stay away from home and helps the local farm economy. On a future trip away from home, it’s easy to search for a B & B which serves a breakfast of local foods. If the B & B’s website doesn’t provide the information, it can easily be obtained by a phone call or an email to the B & B in order to find one which shares this value. Even in the great metropolis of New York City, a search for a B & B returns more than 50 options. Might there be New York City B & B which serves a farm to table breakfast in the heart of the urban metropolis? Based on the remarkable number of New York City restaurants committed to using local foods, there’s a good chance one can be discovered.